Edgar Bergen seems to have come up with something truly distinctive in the way of grotesque and repulsive dummies. Well, after all, you don’t smack it out of the park every time you step up to the plate, and I’m sure Edgar would have been the first to admit he had a real loser in Effie Klinker, a "gossipy spinster" character that more than lived up to her name (she didn’t last long with the act). Bergen added her to the gallery in 1944, but listeners noticed right away that Effie’s voice was awfully similar to Charlie’s, and on the radio, such a thing can cause real confusion. That reaction might be preferable to sheer terror, my own likely response were I to encounter this unholy, grinning visage. Maybe it’s a peculiarly male response, but she looks fully capable of stepping off that couch, walking across the room, and disemboweling you. Far creepier than any Devil Doll I’ve ever seen. Perhaps it is for the good of all that her whereabouts are unknown. You might consider this as you lie in bed tonight. Perhaps Effie will come and visit you there. When it’s dark. What's odd about Bergen is that in his film appearances, you can see his lips move. 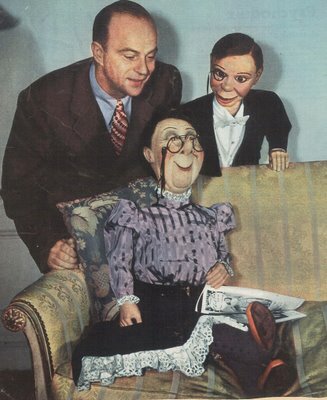 I think it's scary that millions of Ameicans embraced the idea of a ventriloquist on the radio. Charlie McCarthy was funny, but I never warmed up to Bergen's other dummies. Funny guy, though. Effie turned up now and then on "Do You Trust Your Wife," and that was during 1955-57 - so I guess she made a return to the act once visuals were added.